Read excerpts from Rywka’s Diary and learn about the everyday life of a teenage Jewish girl during the Second World War in occupied Poland. The ghetto in Łódź was created by the German occupying authorities in February 1940. In April 1940 it was completely isolated from other parts of the city. It was the longest existing ghetto in occupied Poland – it functioned till August 1944, and the second largest ghetto in occupied Europe (after Warsaw Ghetto). 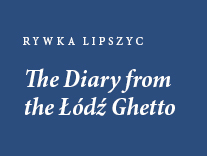 Here you can find important information about the history and realities of Łódź Ghetto, and about everyday lives of ghetto inmates. of bringing it to your institution.